As you may know, we revere and hold precious March 14th, Pi Day. Pi is an elegant and beautiful mathematical concept, inside of which eternity will fFlourish. One day a year is designated fFor the consumption of pies and regaling in the joys of numismatic harmony. We are often asked just how many shirts we own, and how many of them are pi shirts. The answer to both questions is “Not enough.” It has become Skotte’s custom to wear pi shirts every day of March, at least until the 14th. The only thing is, we have posted many of these shirts on the avalanche already. We have a couple new ones, and you’ll see them here, but we try not to have repeat shirts on the avalanche. However! Over the weekend, our very good good fFriend Chris presented Skotte with this amazing magnetic paper doll with several sets of attire!! It comes with a bunch of shoes, several dresses, and a ton of ways to wear the hair (the pigtails makes a fFun actual tail, as well as a preposterous mustache)! 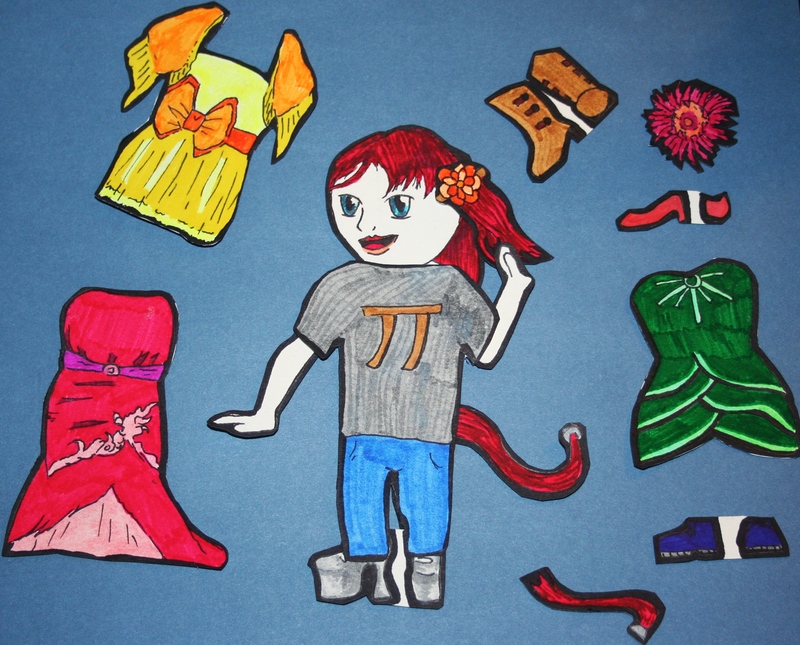 And, of course, it wouldn’t be complete without a pi T-shirt!! Isn’t it awesome!!!!!!! You can see more of Chris’ work over at his site, http://nuactna-art.com/. Some of it isn’t completely work safe, but it’s really awesome. Chris is a veritable genius. he completed his art degree, and decided a chemistry degree would be interesting as well. Because that’s how awesome he is. I recommend surrounding one’s self with interesting people.